Astronauts’ muscles are not subjected to normal loading due to microgravity, which leads to muscle atrophy and reduced strength. They also receive inadequate sunlight exposure and may develop a vitamin D deficiency. This is significant as difficulties in performing strenuous tasks when returning to the Earth’s surface may arise. With that, preliminary research has suggested that vitamin D supplementation stimulates muscle growth. However, it is unclear as to how vitamin D impacts the muscle growth (i.e., hypertrophy) process. This project aims to determine if vitamin D supplementation stimulates muscle growth by combining it with the functional overload of the mouse plantaris. Functional overload is a well-established model of muscle growth and results in a nearly doubling of muscle mass in two weeks. In order to overload the plantaris, the gastrocnemius and soleus are surgically removed, and after two weeks of normal activity while either receiving daily placebo or vitamin D, the plantaris is tested for strength and fatigue and removed for cellular assays. We have hypothesized that vitamin D supplementation will positively impact skeletal muscle growth by increasing muscle mass and greater force production. This will be assessed using a dual-mode footplate system to measure both plantarflexor force and fatigability. Lastly, the cellular mechanisms associated with vitamin D will be examined by measuring the expression of several growth and contractile proteins, such as insulin like growth hormone (IGF-1), fibroblast growth factor (FGF), and vascular endothelial growth factor (VEGF). These factors will be measured using ELISA assays. 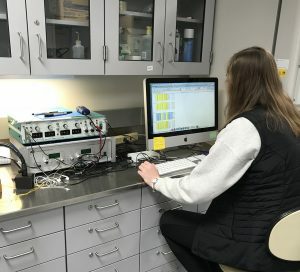 The results from this project may be useful for developing dietary supplementation therapies for astronauts prior, during, and post-mission to prevent muscular atrophy. The Iowa Space Grant Consortium is primarily funded through a NASA Training Grant.